The Galápagos Islands are a very special group of islands situated about 1000 km west of the coast of Ecuador. These islands are famous for their natural beauty and spectacular wildlife. In 1985 I published a guidebook to the islands with the University of Calgary Press. A second edition was published in 1993. A Spanish edition of the book has been produced and came out in 1996. Click hereto see a picture of the cover (125K jpeg). Click here to go to the U of Calgary Press' page on the book. 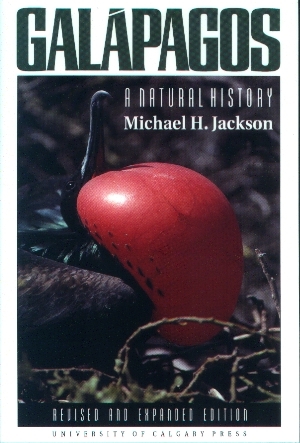 This book, Galápagos - A Natural History, is available in soft cover (ISBN 1-895176-40-9) or in hard cover (ISBN 1-895176-07-7). The Spanish edition is available also (ISBN 1-895176-80-8 soft cover, and 1-895176-86-7 hard cover). The book is readily available in the USA and in Canada via the web. I am working on creating an electronic mailing list for people interested in the Galápagos Islands and their conservation. If you would like to be notified of the creation of this list, please e-mail me.